This is just a little extra step I do before putting on makeup. I'm still a newbie when it comes to makeup, and I've only recently started using primer, but I feel like the smoothing effect is something only I can see. I use it anyway, just in case it really does work, even if I can't tell lol. I use the CANMAKE Smooth Skin Primer*. Over the years I've tried a bunch of different foundations, but nothing came close to the Revlon Colorstay for me. I use their Oily/Combination formula, in 180 Sand Beige. Full, flawless coverage (I have A LOT of acne scars) and stays on the whooole day. My face is the first part of my body that sweats (weird, I know! ), but this foundation stays intact even after walking around in hot and humid Manila weather. I also found that it gives me the best color match, in person AND in photos. The only downside is that the formula is a bit thick, so you have to blend it out properly for it to look nice. (I've already figured that part out though, so it's not a problem.) It feels a bit sticky to use in the summer, but it's the only foundation I trust not to melt in 36°C weather, so! There are only 3 things that I'm looking for in a BB cream, that is: 1) UV protection / SPF, and 2) no grey cast, and 3) little to no scent. I think of BB creams as something that go underneath powder or foundation, so I don't expect them to work as well as the Colorstay in terms of coverage. The ones I currently use, Heroine Make Mineral BB Cream* and CANMAKE Be My Baby BB Cream*, fulfill all those things. The former, I use in place of a base/sunscreen. The latter, I use on ordinary days, like when I have to go outside and run errands but can't be bothered to put on a full face of foundation. For any blemishes or scars that can't be covered up by my BB cream + foundation (gasp! 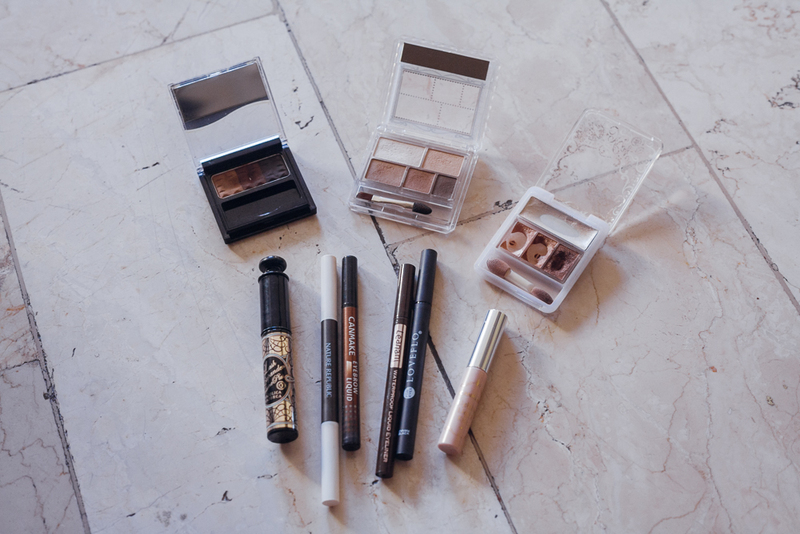 ), I use the NYX Concealer in a Jar in Beige. I'm pretty sure I need a concealer for under my eyes, but I haven't been able to find anything that can successfully conceal my intense eyebags, so I've given up looking (for now). I actually have more than 2 powders, but these are the ones that I'm currently using - the e.l.f. Essential Flawless Face Powder in Light Beige and the MAC Studio Fix Powder Plus in NC30. I only ever use powder on my U-zone (sides of the face + chin), since that's where most of my acne scars are. 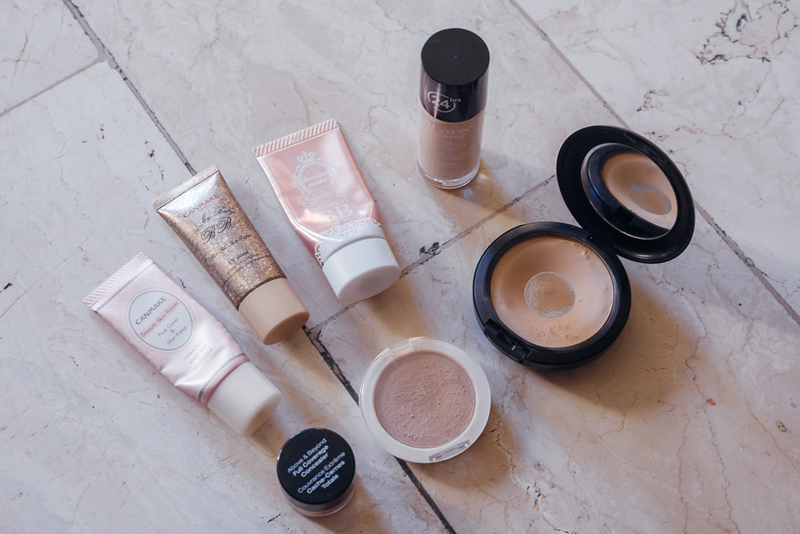 Which powder I use depends on how much extra coverage I need (MAC > e.l.f.). On days when my skin looks nice enough without it, I skip the powder part entirely, because I don't like it when my face looks too matte. I have oily skin but I really can't get enough of the Korean dewy look, ehehe. I'm a BIG fan of orange blush. The problem is, my favorite one got discontinued, I couldn't find anything that could replace it. I found a replacement in the form of Ellefar's Multi Cheek in Orange, which I got from Daiso! Not as orange, but it's okay for P88. I also like the CANMAKE Cheek Gradation in 05 Peach Stripe* a lot, but I only use it for events, because it's a bit too shimmery for me to wear everyday. Recently though, I've only been using the CANMAKE Cream Cheek in CL01*. I was introduced to this product by Tomoko of Prettyfab. Planning on getting the orange version of this very soon! I'm not particularly skilled with eyeshadow.. I cannot blend to save my life (Ｔ▽Ｔ) As a result, I only ever buy the shimmery kind, since it's easier to blend out. (Or at least, if I do make a mistake, it's not as noticeable, heh.) I also prefer buying quads over full palettes, because I'm very indecisive! I don't like the idea of spending so much time thinking about which colors go together. With quads, you already have a set of pre-chosen colors, so you don't have to choose anymore! My favorite is the Majolica Majorca Majolook Eyeshadow Palette in BR355, which I bought years ago, after I found out that Kyary used the same one. I also have the CANMAKE Perfect Multi Eyes Palette in #02 Urban Caramel*, but since it's purely matte, I'm still having a bit of a hard time using it. I'm learning though. For highlighting the area under my eyes (namida bukuro), I use CANMAKE Lighting Liquid Eyes*, which I've reviewed briefly here. I am VERY picky when it comes to eyeliner. It has to be 1) a liquid liner, and 2) waterproof, sweat-proof, smudge-proof, weatherproof, tear-proof, everything! My current ones are from Leanani and Loveflo, in brown and black, respectively. Both of them are of the brush pen type, which is my preferred type of liquid liner. (I used to use a dip liner, but I found pen types are much easier to use.) Both are waterproof, and although they both have the same staying power as my liner of choice (K-Palette! ), I found that the Loveflo one was not smudge-proof (I have oily lids!). The Leanani one performs much better. I used it when we went swimming a few months ago, and it stayed on even after I got out of the water, which was really impressive! For mascara, I only have one that I like, which is the Majolica Majorca Lash Expander Frame Plus. I used to have the brown version as well, but I lost it. I usually don't use mascara unless I'm going to be wearing falsies. For my eyebrows I have the CANMAKE Eyebrow Liquid*, which is an eyebrow pen with a felt tip, the Nature Republic By Flower Auto Eyebrow, and the In2it Waterproof Eyebrow Colour. I don't use all three of these in one go, by the way!! I just use either one or two. I LOVE lip tints. I'm a lip tint convert. I don't know when I first started using them, but because of these I've stopped buying lipsticks completely. I'm the type that can't be bothered to keep checking my makeup once it's on, so wearing lipstick is a bit of a hassle. So when I discovered the power of liptints, I became a fan instantly. 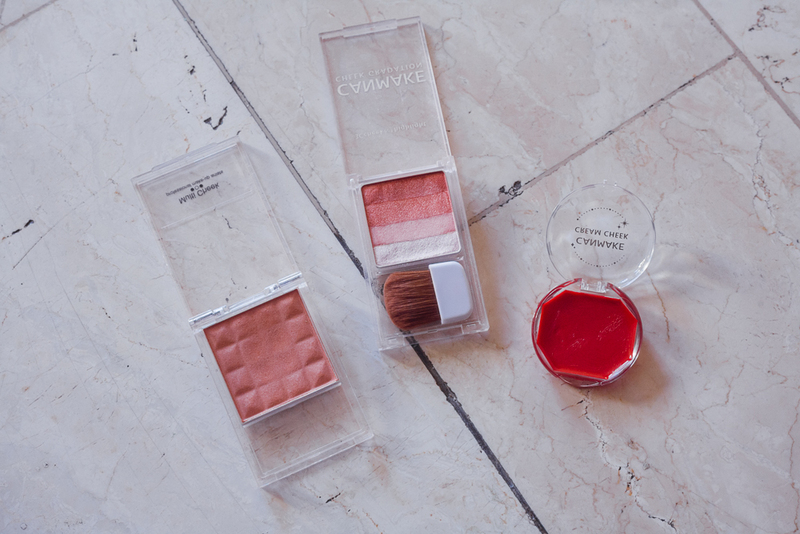 The ones I use are TONYMOLY Cat Chu Wink Tonytints in Orange and Red. They stay on for a long time, and I only have to re-apply after a few hours, or after eating or drinking. What I like to do is apply the tint on the center of my lips, blending it out to create a gradient effect, adding more on the center, then setting it with Maybelline Baby Lips. For lip balm, it HAS to be Baby Lips for me! I tried other lip balms and it just didn't feel quite right. Other lip products I like are the CANMAKE Whip Mousse Lip in 01 Raspberry Red and Candy Wrap Lip in 04 Lady Strawberry (both reviewed here). It's also probably obvious by now, but another reason why I prefer lip tints and lacquers is because it's easier for me to apply with a wand vs directly applying the color with lipsticks. 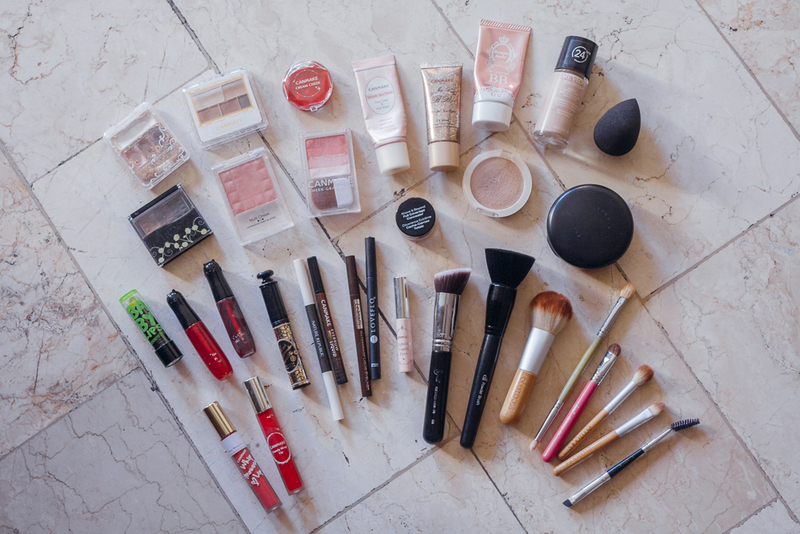 Last but not least, makeup tools! 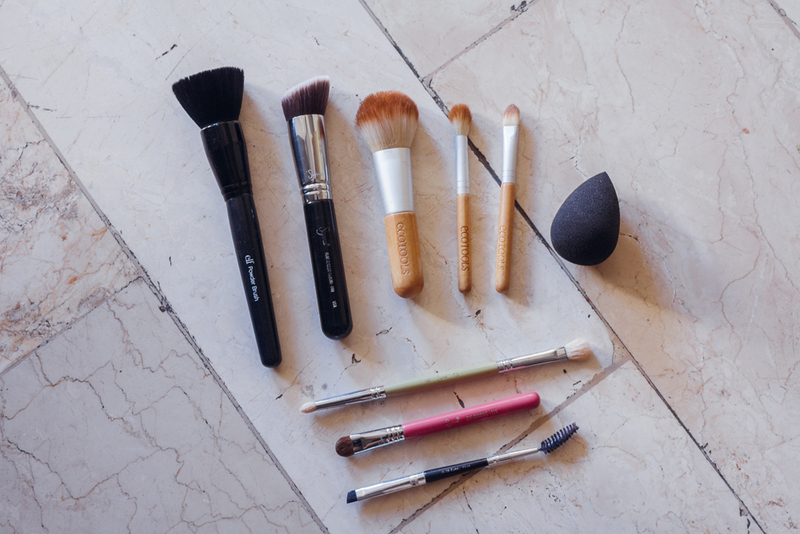 I wasn't quite sure if I should include this, since I'm still in the process of ~*~refining~*~ my makeup brushes (meaning, I might have already chucked some of these out and replaced them by the time this post is published), but why not! I use the e.l.f. Studio Powder Brush, for powder, and the Sigma F88 (which I posted about here), for foundation. I also have the Mineral Powder Brush, Concealer Brush, and Eye Shading Brush from the Eco Tools 5-Piece Mineral Brush Set. This was my very first brush set, but I only ever used these three. (I don't remember where the other two brushes are..) I use these for blush, concealer, and highlighting, respectively. There's one more brush that I wasn't able to include here (I forgot to take it out of the powder pact that I put it in when I took photos the previous day, and doing the whole thing over would have been a hassle), which is the CANMAKE Marshmallow Finish Face Brush (also reviewed here). I use it for when I contour the sides of my face. For eye brushes, I only have two, a Sigma E25/E30 Dual-ended Brush from the Bare Palette*, and a Sigma E55*. I got both from when I was still part of Sigma's Affiliate Program. My cheapest yet most-loved brush (as in, I've had this brush the longest) is the Marionnaud N38 Brush from Watsons, which is a dual-ended eyebrow brush and spoolie. This is super cheap and costs less than P100, yet works really well! The newest addition to my makeup bag, the much raved about Beauty Blender! I put off getting this baby for so long, thinking P1000+ is too expensive a price for "just a sponge", but I finally caved in and bought it. I LOVE IT. Where has this tiny thing been all my life? I use it all the time now for my foundation, and even though the Colorstay formula is a bit thick, this gives me a really nice airbrushed finish every time! And that's it! 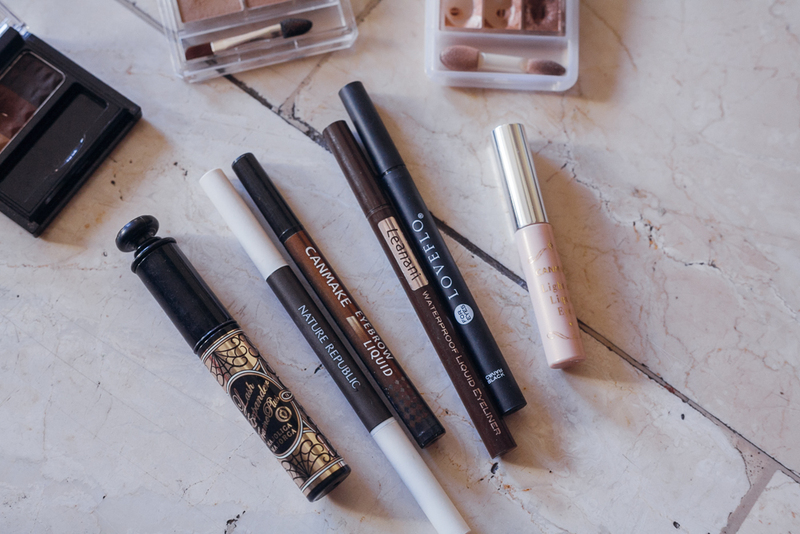 The truth is, I was hesitant to call this a "what's in my makeup bag" post, but while I was editing the photos I realized that I completely forgot about my makeup bag, and just took photos of the contents, haha! _(:3 」∠)_ Also, I actually have two makeup bags: one for all of this, and the other for essentials. All my other special cosmetics (for certain occasions, for events, for cosplay, etc. ), I keep in a drawer. I'll probably do a post on my makeup essentials next time, so you can see what kind of makeup I bring around when I travel and stuff. I've also gotten a couple of requests to do more makeup-related posts, so I made this and created a couple of tutorials to be posted in the future. For now, I thought this would be a great post to start with, so I hope you liked it! DISCLAIMER: Items with an (*) were sent in for review. Opinions remain 100% my own. Also, this post contains affiliate links. Clicking those links before you make a purchase means that Chainyan.co receives a small commission, which helps to support the blog. Please see my full disclaimer for more information.